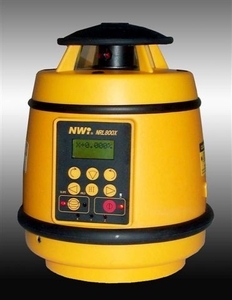 Northwest NRL800X Rotary Slope Digital Laser with Detector___FREE SHIPPING___ The NRL800X is a true grade rotating laser capable of + / - 8 degree dial-in grade. It is accurate to 1/16" at 100 ft with 2000ft range, and it is equipped with an electric servo motor to ensure automatic and accurate leveling. It has two beams to give it versatility in leveling and plumbing. 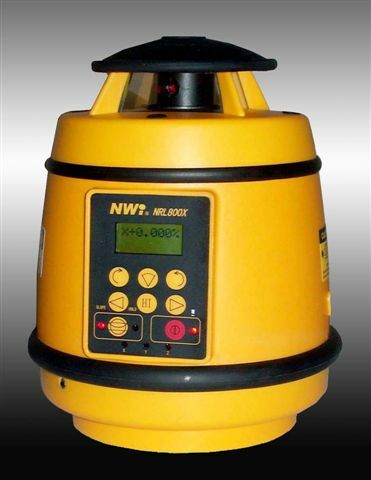 Northwest NRL800X rotary laser level is a true programmable grade rotary slope laser capable of + / - 8° dial-in grade. It is 1/16” accurate at 100 feet and it is equipped with an electric servo motor to ensure automatic and accurate leveling. It has two beams to give it versatility in leveling and plumbing. It has tremendous value in applications ranging from leveling concrete forms to ramps and drainage Specifications: Laser Beam: Horizontal & Zenith Wave Length: 635 nm. Rotating Speed: 600 rpm. Operating Range: 2,000 ft w/ Detector. Self Leveling Range: +/- 5º. Self Leveling Method: Electronic Servo Motors. Leveling Accuracy: 1/16” in @ 100 ft horizontal 1/8” in @ 100 ft vertical. Programmable Grade Settings: +/- 8º. Power: Rechargeable Batteries. Tripod Adaptor: 5 / 8 x 11 thread. Includes: Remote Control, Rechargeable Batteries & Charger, Bracket, Grid Target, Glasses, Carrying Case & Manual . Visible beam for interior work.